When it comes to choosing the best property Auctioneer for your needs the name of Bagshaws Residential has been synonymous with a quality service and high success rate for decades along with the recent achievement of the silver award at the Auction House negotiator awards 2015. They sell properties under the hammer from right across the Midlands and as part of Sequence, co-operate closely with a nationwide network of prime situated offices including Shipways, William H Brown, Brown and Merry, Fox and Sons, Barnard Marcus, Connells, Ashley Adams, Paul Dubberley and Burchell Edwards. The Midlands auction team of friendly professionals have well over 100 years collective experience in Estate Agency and have guided thousands of property owners and purchasers to their desired goal. If auction is something you're not too familiar with they will explain the whole process in a clear, easy to understand way so you can confidently decide if it is for you. For a completely free non committal auction assessment of any property from a pond to a palace please don't hesitate to get in touch. Why choose to sell your property at Auction? 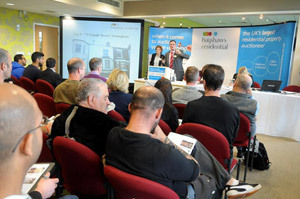 There is no clearer, quicker or easier way to sell a property than by auction. It is increasing in popularity all the time as more and more buyers and sellers appreciate its fairness and transparency. It avoids all the delays caused by chains, surveys, changes of mind and gazumping which can beset so many Private Treaty sales. Auction is also the best determinant of a property's real value and provided the guide and reserve prices are set at realistic levels many properties sell for more than the sellers expectations. For centuries the fall of the auctioneer's hammer has legally sealed binding contracts and this is just as true now in our 21st Century High Tech World. 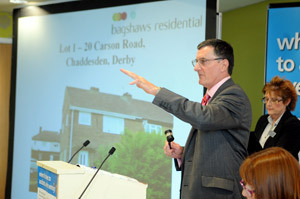 Don't be misled by so called 'modern on-line' auctions which are not the same, by using Bagshaws Residential, once the price is accepted under auction conditions, it cannot be re-negotiated.